I love non-vegetarian recipes to the core. Especially fish recipes and chicken recipes. Though am a chicken lover, I can't even think of a lunch meal with a fish curry or fried fish recipe. As am from Kerala, the south Indian state fish is my staple food. But everything changed when I shifted to UAE. Still, i somehow managed to get fresh fish once in a week. I never encourage using frozen fish but fresh fish recipes are my all time favorite. I make fish curries with fresh fishes only. If not I will go for fish fry recipes or tandoori fish. Let's come to the recipe. Here am with a less hot, less spicy simple delicious grilled fish recipe with hamour fish. 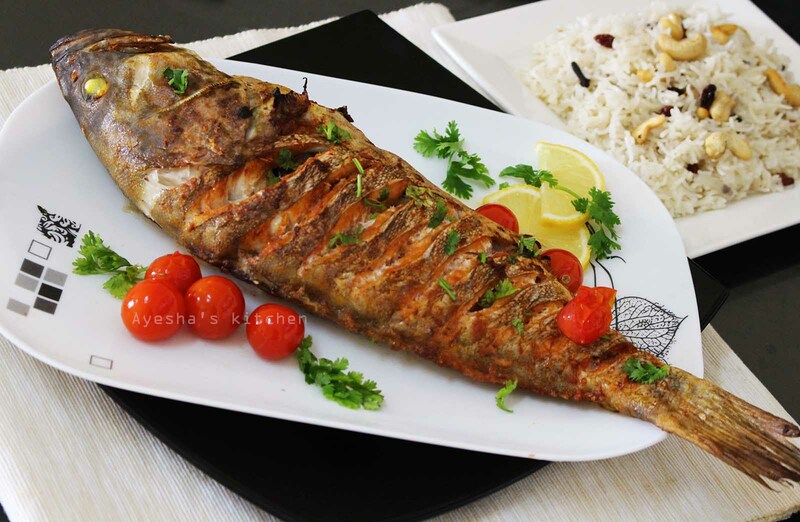 Hamour fish is a tasty fish when grilled, fried or curried. 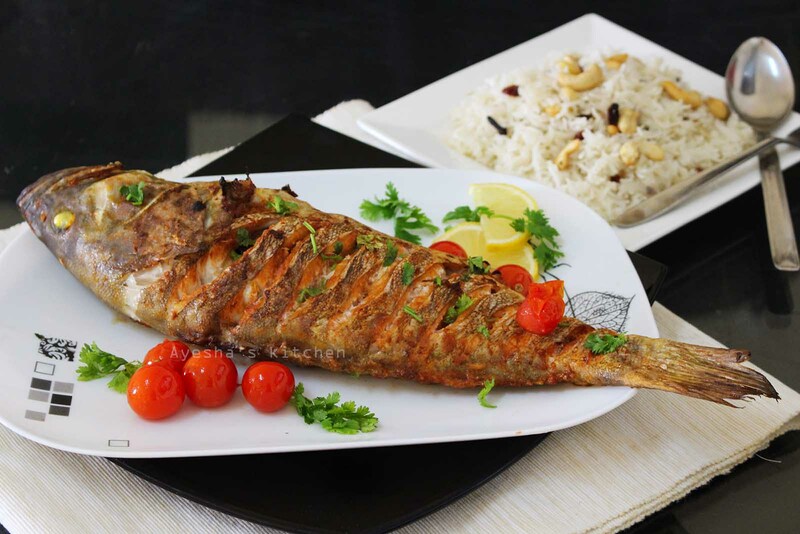 Hamour fish recipes is one of the most favorite fish recipes in Gulf countries. This fish tastes excellent when fried also. Today I thought of sharing a healthy fish recipe with you guys. So let's grill this hamour fish with simple ingredients which taste really awesome. Clean the fish well and make slits using a sharp knife. Drain the excess water and set aside. Grind together all the ingredients given under ' marinate with ' to a fine paste. Marinate the fish with this fish marinade and keep refrigerated for at least 15 minutes. Preheat the oven to 200 degree C for 5 minutes. Drizzle oil over the grill (it prevents sticking the fish to the grill) and keep the marinated fish over it. Place a baking tray under the grill (optional only). Top the fish with butter cubes. Set it in the middle rack of the oven. Let it cook for 10 minutes. Once done, flip over and again cook for another 10 minutes. The time taken depends upon the thickness of the fish. Garnish with grilled cherry tomatoes and lemon slices.